The third stop of my wine-making gap year was Mád, a small village in Hungary’s Tokaj wine region with the most Grand Cru vineyards sites classified in 1737. The village only has three restaurants, two mini-supermarkets, one bar and it takes Sunday off. This solitary place surrounded by rolling vineyards with majestic sunrise was my home for a month where I learnt all about Aszú berries, the ugly ducking of wine, under the guidance of the Holdvölgy team - winemaker Tamás Gincsai, viticulturist Károly Erdélyi and three wonderful ‘Aszú’ ladies. These Aszú berries will be transformed to one of the most beautiful wines in the world. 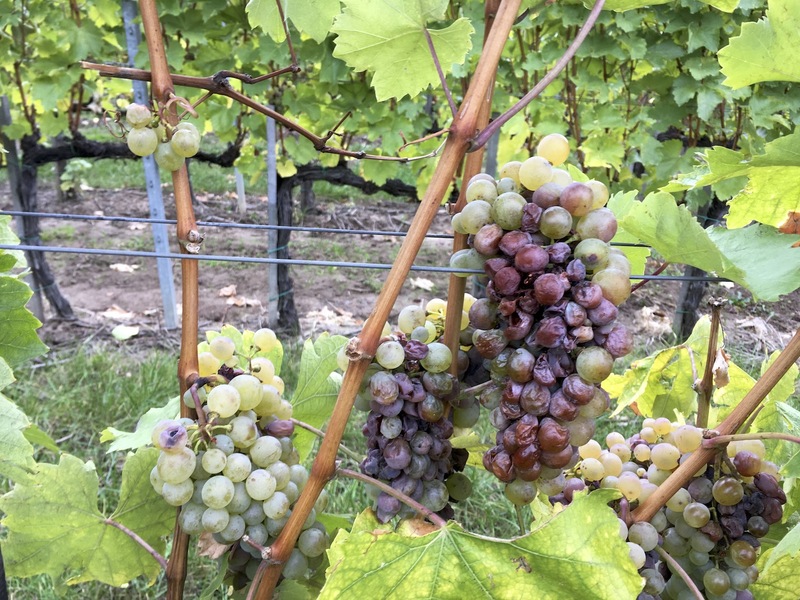 Botrytis Cinerea is a mould that infects grape berries under humid condition, and it can turn into undesirable grey rot or the sought-after noble rot. For noble rot, berries must be ripened when they are infected. The misty humid mornings must then be followed by warm and sunny afternoons so affected berries can be dehydrated thus concentrating the flavours, sugar and acidity. Berries affected before they are ripened or if the weather does not cooperate, the mould will turn into grey rot. Noble rot berries shrivel like raisins and taste sweet with intense aromas. In contrast, grey rot berries are totally dried inside (imagine a paper balloon) and taste musty and sour. A bunch of grapes often consists of healthy grapes, and various degree of noble and grey rots. A few wine regions are famous for their noble rot sweet wine but I have to say Tokaj is the region that really masters the art of noble rot winemaking. Tokaj makes different styles of wine from botrytis grapes at different stages of development therefore pickings are extremely selective. 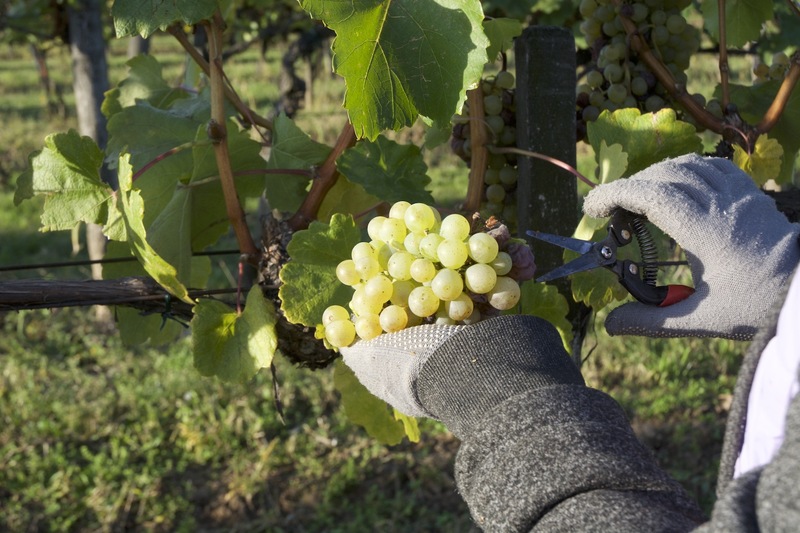 Any one parcel of vines is picked a few times during the harvest season. Picking is a long process, naturally done by hand and with cautious. At Holdvölgy, a 26ha wine estate, the 2017 harvest began on 30th August and lasted until mid November. I experienced first-hand picking of the botrytis grapes for every style of wine. 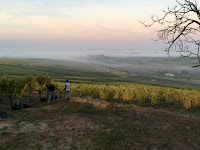 Grapes for sparkling and dry wines were picked first. Only healthy bunches were picked and botrytis-affected berries were removed on site. 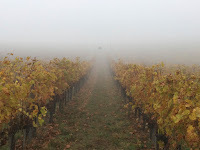 This was followed by grapes for late harvest wine, which were picked a couple of weeks later. 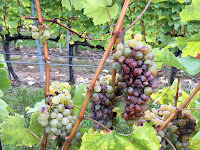 The grapes were slightly over-ripen with some noble rot berries. However, only bunches with around 20% noble rot berries were selected and all grey-rot berries from the bunches had to be discarded. The wine is sweet with intense ripe fruits aromas and a hint of botrytis bouquet, similar to an Auslese from Germany. Szamorondni is a Polish word meaning ‘as it is’. It is a traditional style of Tokaji wine that is made from grape bunches picked as they are, including both healthy and noble rot berries with various degree of botrytis. It can be dry or sweet. Grape bunches with less noble rot berries are used to make dry Szamorondni, while those with more noble rot berries are used to make the sweet Szamorondni. Holdvölgy made both styles in 2017 and these grapes were picked at different time when winemaker Tamás reckoned the grape bunches were ready for the style of wine he had in mind. 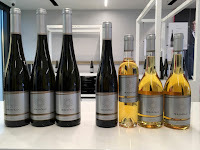 Holdvölgy planted all six permitted grape varieties in Tokaj: the well-known Furmint, Hárslevelü and Sárgamuskotály (Muscat Blanc à Petits Grains), as well as the lesser-known Zéta, Kabar and Kövérszölö. They ripen at different time with Zéta being the first and Furmint the last. 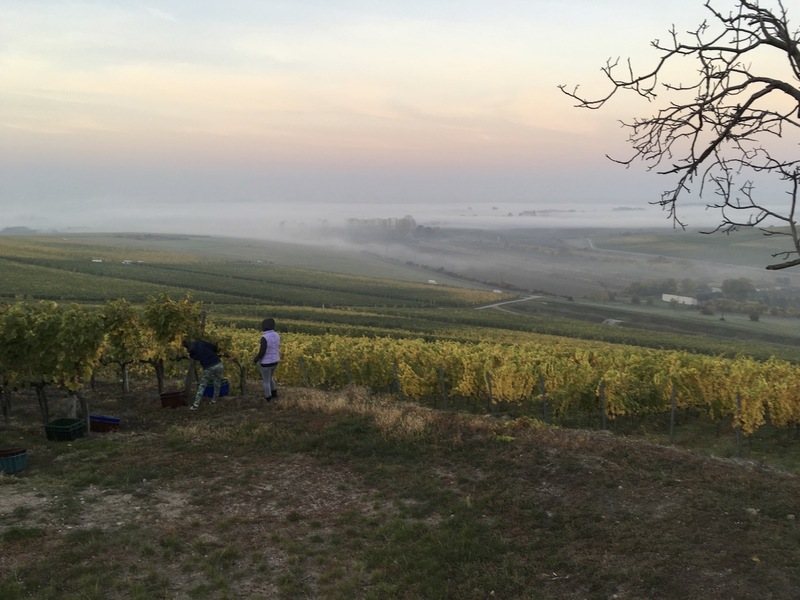 Picking started at sunrise and viticulturist Károly would tell the team what to pick - healthy bunches of Hárslevelü only with no botrytis berries, Sárgamuskotály bunches with 20% or 50% noble rot, or pick all Furmint except those with more than 80% botrytis bunches. 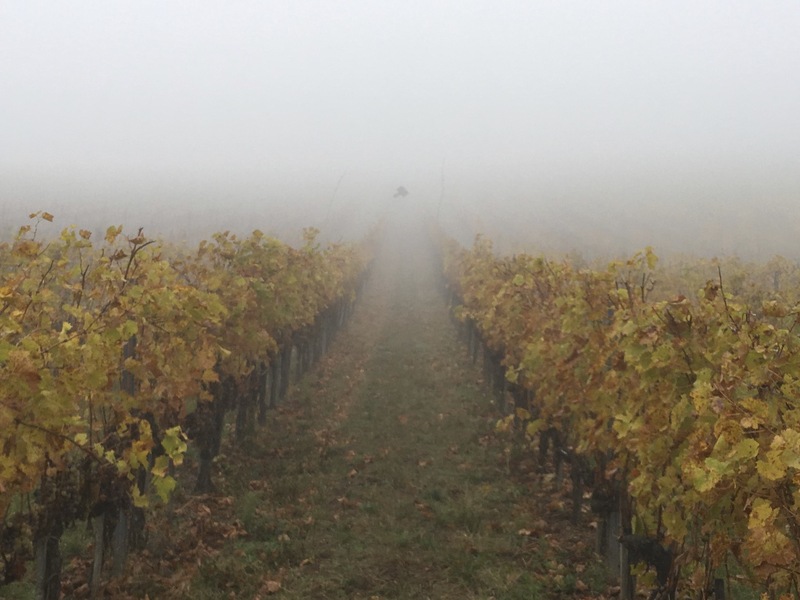 Károly followed the weather forecast closely as it could change the harvest plan. For example, if rain or cloudy weather were forecasted in the next few days, noble rot development would slow and more grey rot could develop. In any case, removal of grey rot berries was absolutely necessary. It is easy to differentiate the bad rot from the good one when there are only two berries but believe me, it is confusing when you have to look for them in a bunch. I had to use all my senses - sight, smell and taste to make sure I did the job properly. And those were the easy pickings. The most time consuming was the picking of Aszú berries, the heavily botrytis, raisin-like berries. Berries are picked individually only when they achieve the level of botrytis equivalent to over 500g/l sugar (around 27% potential alcohol). Different grape varieties and bunches/berries develop botrytis at different speed therefore each bunch has to be visited a few times before all the berries are picked - a painstakingly long and slow process. While the picking team was busy selecting the bunches to pick, the three ‘Aszú’ ladies at Holdvölgy would patiently pick the ‘ready’ berries, about 40 kg on average per day (a bunch of grape weighs around 1kg). They would do so every day during the entire harvest season until the last Aszú berries were picked. 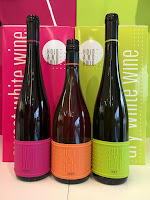 Tokaji, the king of wines, is made in a unique way different from other noble rot sweet wine. Sauternes is made the sweet Szamorondni way using a mix of healthy and noble rot grapes; while Beerenauslese (BA) and Trockenbeerenauslese (TBA) are made only with botrytis affected berries. In both cases, grapes are pressed and only the juice is fermented. Tokaji is made by macerating Aszú berries in fermenting or finished base wine from 10 hours to a few days before they are pressed and continued to ferment. This skin contact method similar to that in red wine making extracts more flavours from the raisin berries. The wine is therefore extremely rich and complex. The sweetness of the wine depends on the amount of Aszú berries added to the base wine, traditionally measured in puttonyos. Tokaji 3 puttonyos has at least 60g/l residual sugar, and Tokaji 6 puttonyos has a minimum of 150g/l residual sugar. The Hungarian grapes have high natural acidity and the dehydration process also concentrates the acidity therefore Tokaji always has an incredible fresh finish no matter how sweet the wine is. Unfortunately, after World War II during the Communist era, state-owned Tokaj producers flooded the market with inferior sweet wine. The wine, heavily oxidised and often artificially sweetened, was labelled with various puttonyos. According to Gergely Somogyi, editor of tokajtoday.com, the 70s and 80s were the darkest period of Tokaji wine. In the late 1990s after Hungary became a republic, independent wineries re-established in Tokaj with the aim of reviving the industry. 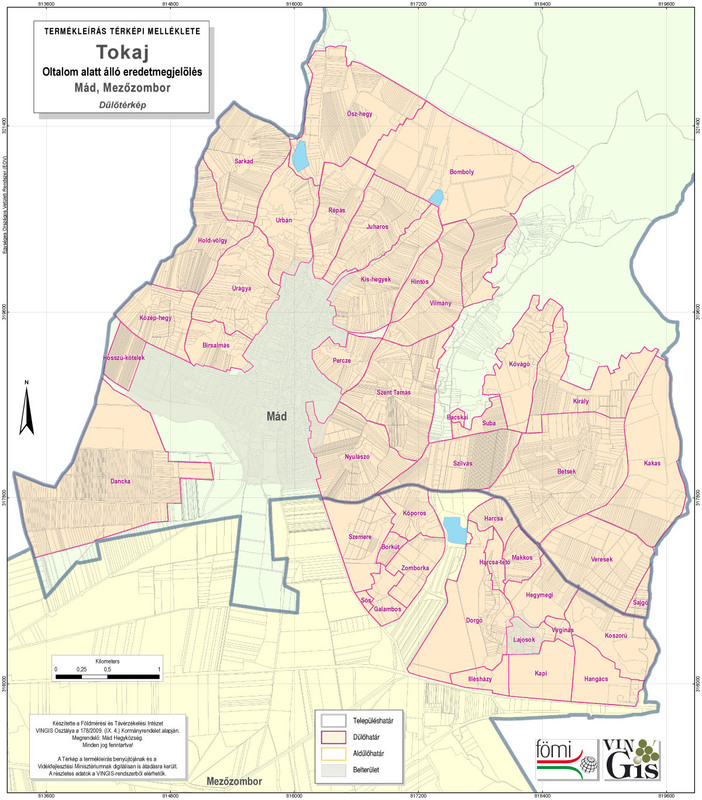 In 2014, the Tokaji Trade Council eliminated the 3 and 4 puttonyos categories, and introduced the new quality level, Tokaji Aszú, for the 5 and 6 puttonyos categories. The term puttonyos was therefore officially abolished. For a wine to be named Tokaji Aszú, it must have at least 120g/l residual sugar. Wineries welcomed the change as part of a renaissance for the Tokaj region. 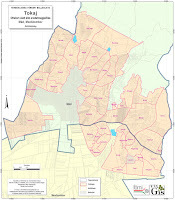 Tokaj was the first wine region to be demarcated in 1737 and the Mád basin has the highest number of Grand Cru sites of mostly volcanic soil. The story of Holdvölgy, translated as moon valley, began with a one-hectare vineyard in the Nyúläszó Grand Cru site in Mád, a birthday present from Pascal Demko’s mother to his father. Pascal, a trained lawyer with a passion for wine, slowly acquired more land and eventually made his first wine in 2006 from 26ha of vineyard in seven Grand Cru sites in Mád. 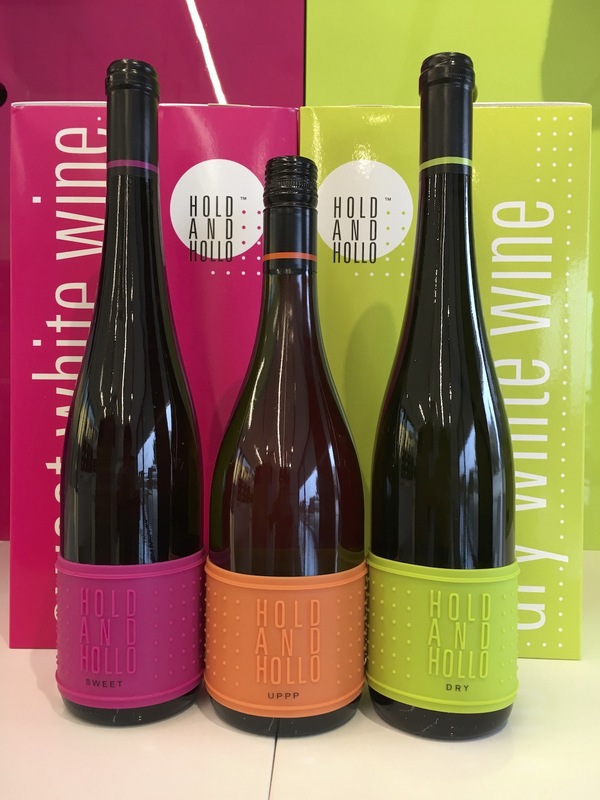 Today, the estate produces two ranges of wine: Holdvölgy with a elegant and classy label, and Hold And Hollo, an eye-catching, stylish label for casual occasions and cool consumers. The quality of Holdvölgy award-winning wine is without doubt. Both ranges are being served in fine dining restaurants and trendy bars in Europe; and Hong Kong sommeliers and wine lovers are asking for them. Having spent a month with the team, one word that constantly popped in my mind about Holdvölgy is precision. From grape picking to wine labelling, every process is immaculately carried out to convey the essences of the estate and its wines. Vision is a dry white blend of Furmint, Hárslevelü and Kabar that defined the house style; while Signature is a sweet blend combining various Tokaji winemaking techniques such as but not limited to late harvest, Szamorondni and Aszú, that Pascal compared to free style figure skating - freedom to express using highly skilled techniques. The other wines are called Meditation, Exaltation, Eloquence and so on - names that reflected exactly what are in the bottles. Even the easy-going Hold And Hollo range is presented in a highly orderly manner where the capsule, the silicon label and the bottle are all aligned. Some people compare winemakers to artists but I would say Holdvölgy is more like a designer, which probably comes from Pascal’s professional training.The team creates beautiful wine and communicates it effectively to the customers. Looking from the other way, customers have high expectations after seeing the bottles and they are not let down by the content. Artists can be emotional whereas designers are unambiguous but both achieve perfection in different ways. Holdvölgy wine is not available in Hong Kong or China yet. I have no doubt both ranges will be well-received by consumers. Hold And Hollo label will be a hit if marketed right. All Pascal needs is a far-sighted partner who shares his vision.